South Africa got their Cyprus Cup campaign off to a solid start with a 2-2 draw against Finland on Wednesday, a side positioned 20 places above them on the FIFA World Rankings. The tournament is an important one for Banyana Banyana as they build towards the FIFA Women’s World Cup in France later in the year and coach Des Ellis will be pleased with the way they rallied twice to equalise. It was also a landmark day for midfielder Refiloe Jane, who earned her 100thcap and was handed the captain’s armband by Janine van Wyk in honour of her achievement. There were no goals in the first half as the Fins created the better opportunities, with Banyana’s best two falling to striker Rhoda Mulaudzi, who first headed over and then shot wide with just the goalkeeper to beat. Finland took the lead early in the second half when forward Juliette Kemppi broke the deadlock, before heavy rain forced a stoppage in the game for 10 minutes. A foul on striker Jermaine Seoposenwe in the box allowed South Africa to equalize as Leandra Smeda fired home the spot-kick. But Finland restored their lead through Chelsea star Adelina Engman, at which point it looked as though Banyana were headed for defeat. 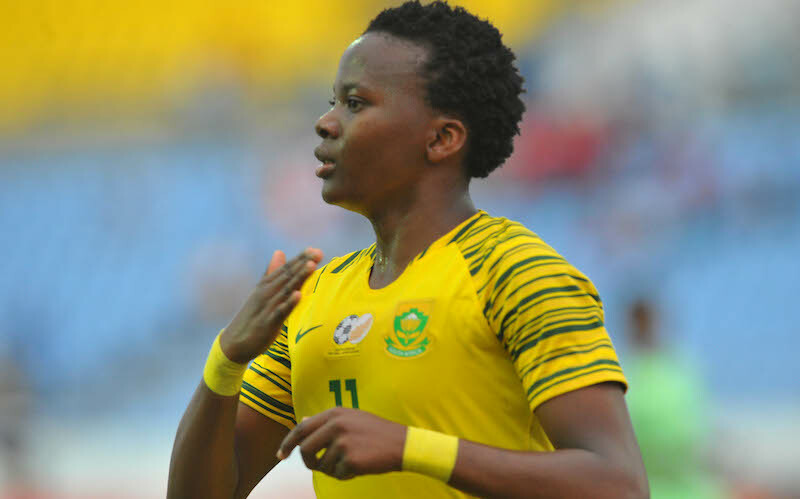 But so often when the chips are down, reigning CAF Women’s Footballer of the Year Thembi Kgatlana comes up trumps and she had a run at the Finland defence, before firing into the back of the net. Banyana are next in action on Friday when they play North Korea. Their final pool game will be on Monday against the Czech Republic.